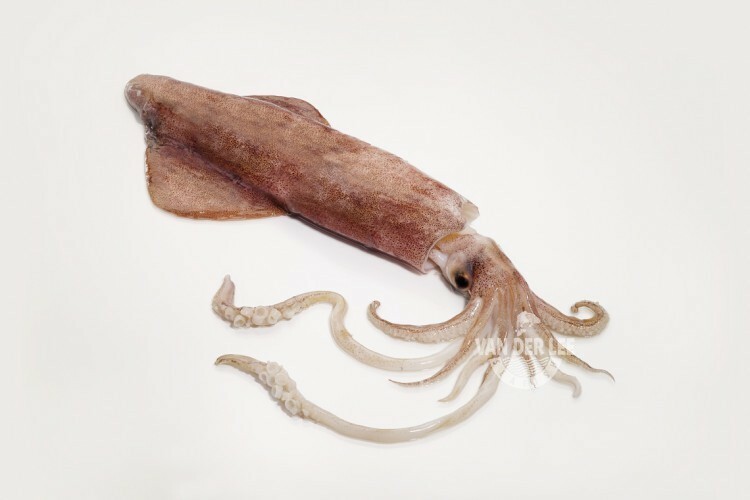 We have whole squid available which is made of Loligo vulgaris. The Loligo vulgaris is also known as the European squid. This type of squid is a commercially valuable species that lives in the Atlantic Ocean, which is also known as FAO fishing area 27. Since the European squid lives in coastal waters from the North Sea to the west coast of Africa, we primarily catch it ourselves with our own Dutch fishing fleet. After the squid is caught we only take the best ones and we immediately process and freeze them to keep the freshness. As a supplier we sell our squid whole round. We also have squid rings and squid tubes available, which are made of the Todarodes pacificus, at our ‘Fish Worldwide’-page. Squid has a light seafood taste and it is a little bit chewy. When you cook it you should pay attention to the time since squid will taste rubbery if you overcook it. There a lot of different ways to eat squid. Most people like to eat the arms, tentacles or the body of the squid, but even the ink is edible and will taste slightly salty. The only parts which cannot be eaten are the beak and the gladius of the squid. Squid is really healthy since it contains a lot of vitamins. One hundred grams contain only around 82 calories, which depends on the way in which you prepare it of course. Squid also contains a lot of protein, which are necessary for growth and repair and the structure of all living cells. We mainly export our whole squid to the countries Italy and Spain. However, the European squid is actually eaten in a lot of countries. Especially calamari is a well-known dish which includes squid. Calamari is the Italian word for ‘squid’ and this dish consists of fried and breaded squid rings served with Parmesan cheese and marinara sauce. Squid can also be served as a risotto, in a salad or with almonds and smoked paprika, which will be a really healthy and delicious dish. You can also roast the squid whole in olive oil, fish stock and serve it with garlic and parsley.